Are you repelling wealth and abundance? Are you attracting wealth and prosperity to you or are you repelling them? Prosperity and abundance all start in the mind. So, if you're working to achieve those things it's important to be aware of your perception of them. In this video, my goal is to help you become more aware of your thoughts and what those thoughts are attracting to you. Also we have to be aware of what programing we're allowing into our minds because popular media at large can have a huge impact in planting and re-enforcing beliefs that will repel prosperity and success and hinder your efforts from achieving your goals. So take some time to view this video and let me know what you think! 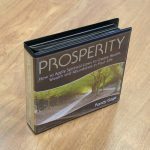 To check out Randy Gage's Prosperity (8-CD audio album) set that I talk about in this video, CLICK HERE. This particular audio set has made a profound impact on my life and it can for you as well.